How do I set up Fraudwatch Screening Rules? 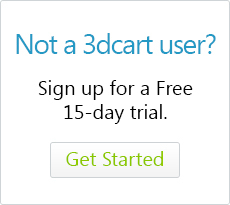 3dcart Fraudwatch users can create special "Screening rules" on their store which will automatically approve, reject, or flag orders for review, based on the information being reported by fraudwatch. Fraudwatch Screening Rules require an active subscription plan to the 3dcart Fraudwatch program. Users of the free Fraudwatch transaction per month plan will need to upgrade their respective plans in order to use the Fraudwatch Screening rules. More information on using Fraudwatch as well as upgrading your Fraudwatch Plan can be found by clicking here. Fraudwatch Screening Rules apply before the order is allowed to proceed to the Credit Card validation process, thereby allowing you to reject orders automatically before the order gets to your payment gateway. 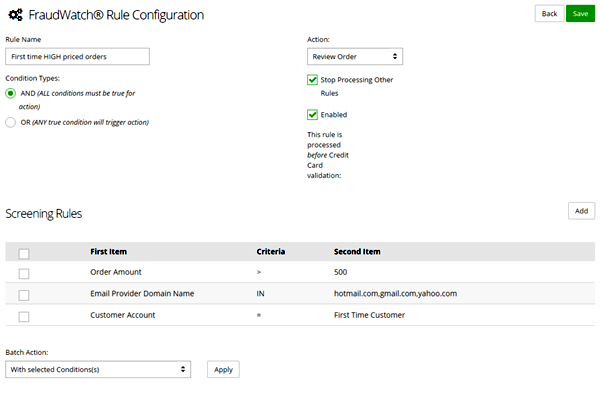 You can also automatically approve orders or otherwise place them under review status which allows you to review the order before processing it fully. This article contains the following areas. Click on a link below to be taken directly to that topic. Then, use the search bar at the top to search for "Fraudwatch" to view the module. This checkbox will enable the Fraudwatch module on your store. It is generally on by default since there is 1 free call that is made to the Fraudwatch service per month. This link will allow you to upgrade/downgrade your Fraudwatch subscription as needed. To access your Fraudwatch Screening Rules, click on the Screening Rules link indicated above. Once you click on the Screening Rules link, you can begin adding your rules by clicking on the "+Add" button located at the top right. All conditions must be met in order for the action to trigger. Any one of the conditions specified in the rule can be applicable to the order in order for the action to trigger. Order is approved and allowed to proceed to the credit card validation processes. Order is prevented from proceeding to the credit card validation process and, more importantly, prevented from getting to your payment gateway. On the store front, the customer will get a generic message advising them that their "Credit Card Cannot be processed at this time" and they are not allowed to proceed further. This action allows the order to proceed to Credit Card Validation, but rather than placing the order into your store's "New" order status, it is placed in a special "Review" order status, allowing you (as merchant) to have a look at the order and its Fraudwatch information. From there, you can make the decision to process the order or cancel/refund it as needed. Enabling this checkbox will prevent any other screening rules from applying if the conditions on this specific rule are met and actions triggered. This checkbox activates/deactivates the specific screening Rule as needed. 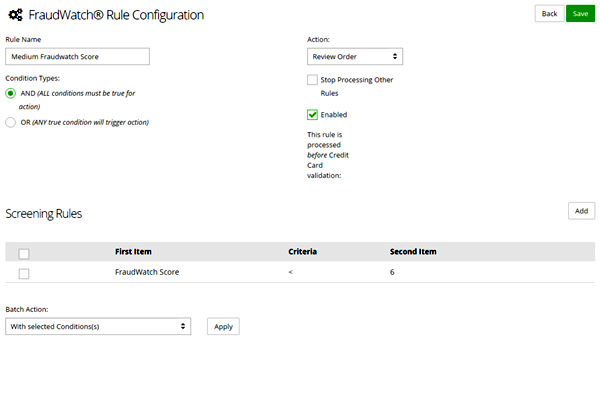 Review Status is a new status for orders that was added to the store as part of the Fraudwatch Screening rules. If you are unable to see your store's "Review" order queue, it may be due to having the status hidden. To check this, please go to Settings ->General ->Store Settings and click on the "Checkout" tab located along the top. Once there, look for a link labeled "Edit Order Status" within the middle section of the page. Check to see that the "Review" status has a mark in the "Visible" checkbox to make it viewable in your store admin interface. After you're done with the Configuration section, save the Rule. Now, you will have the opportunity to create the specific Screening rule conditions that must be met in order for the Rule to apply its specifed action. To add a condition, click on the button labeled "Add" found in the bottom half of the page (Labeled "Screening Rules") This will give you three settings to configure. The second drop down is for the Qualifier of the order. This is where you can specify if the previously set parameter is equal to, less than or greater than a specified variable. Some qualifiers are preselected based on the Parameter that is chosen. *The Parameter/Qualifier/Variable combinations make up the conditional aspects of the screening rule. Depending on the Parameter that is selected, you will have different choices for the Qualifier and Variables. **The variable for Email Provider Domain Name is an open text box that can accept one or multiple domain names. This can be useful for filtering email addresses for free email services that are typically used for fraud. For example, if you want to have the condition used for HotMail email addresses, simply enter "hotmail.com" in the field. If you'd like to have the condition used for HotMail, Gmail, YahooMail or other free email domains, enter each domain separated by a comma. ***The variable for the Fraudwatch Score is an open text field that can accept number values based on the Fraudwatch scoring system. For this field, enter a number between 1 and 10. You can add as many conditions to the rule as needed. 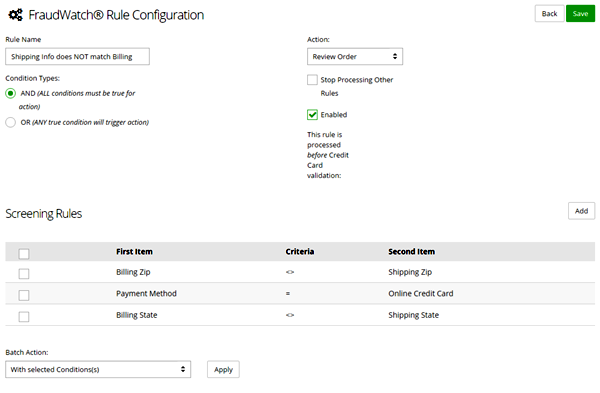 Furthermore, you can add as many rules to your store as needed for your business' order filtering. In the next section, we will provide some common situational rules and their conditions to help you see how to create your own. The following example rules are presented for demonstration purposes only. There are many different variations of FraudWatch Screening Rules that can be created. Furthermore, your business needs may be far different than what is being presented here in these examples, so we urge you to exercise caution when creating your store's Fraudwatch Screening Rules. Being as a returning customer or anyone with a good Fraudwatch score is likely to pose no danger of fraud, this rule is also set to "Stop processing other Rules" once this one is met. Being as a score of 6 would make the order slightly risky, anything more than this number might deserve some attention. However, please note that the "Stop Processing Other Rules" checkbox is not marked. This is because the store's other concurrent rules might find something even more damaging on the order in which case those actions will be taken. This rule also is not set to stop all other rules, since there might be other conditions met to further approve or reject the order. Customer's email address is for either hotmail, gmail or yahoo's free email services. The reasoning behind this rule is the fact that it's a large order for a first time customer who is using a free email service on their order. Therefore, the order is being placed into the store's review status in order to allow the merchant the ability to look things over and perhaps verify the customer's information via a courtesy call before fulfilling the order. Due to the suspicious nature of orders matching these criteria, the rule is set to not only cease processing all other rules, but also reject the order outright. This way it does not even get to the Credit Card Gateway in the first place. On the store front, the "customer" will get a generic "Your card cannot be used at this time" message and will not allow them to reach checkout at all. As you add Screening Rules to the store, they are added to the Screening Rules page of the 3dcart Online Store Manager. This page is the one you access when clicking on the "Fraudwatch Screening Rules" link inside the Fraudwatch module at the start of this article. The page will list all of the Screening Rules that have been created on your store. 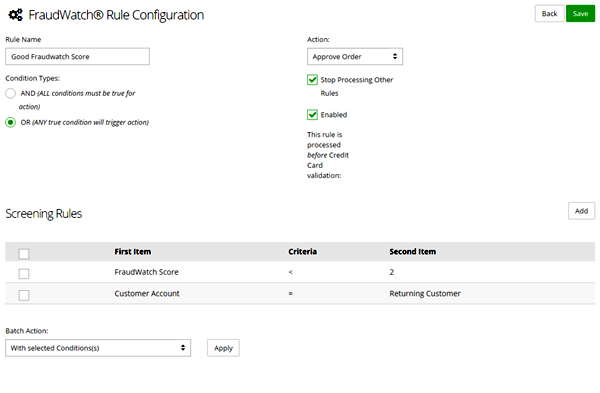 They will be displayed in a grid showing the rule's Name, Type, Action, Whether it has a stop to all other rules (stop rule), whether it is enabled, and what the rule's sorting value is. The sorting of the rules determines the order in which the rules are run on the store. This is important to note because you may have some rules that are set to stop all other rules when their conditions are met. Therfore, you may want to sort your rules so that they follow a specific flow to ensure a "Stop Rule" doesn't run before a secondary rule that may always need to run.